The Beacon Academy believes in the importance of our students reaching out and helping others throughout their four years at the Academy. The Community and Service Club is an after school organization that offers students opportunities to develop their sense of caring for others and for the environment as students initiate individual and collective action that make a positive social impact. While Creativity , Action, and Service (CAS) is a at the heart of the IB Diploma’s programme. It is one of the three essential elements in every student's Diploma Programme experience. It involves students in a range of activities alongside their academic studies and enables students to enhance their personal and interpersonal development through experiential learning. At the same time, it provides an important counterbalance to the academic pressures of the rest of the Diploma Programme. The Early Readers Project is a Community and Service Project at the Beacon Academy. Through this project we hope to help Filipino children by providing little books for emergent readers in downloadable and printable format for use in schools and homes all over the country. These early readers have been written, illustrated, and produced by high school students at the Beacon Academy. Students go through a workshop before production so that they are aware of any issues of language or concepts, and go about the writing and illustrating in a deliberate and thoughtful way. There is a mentoring process in place, and the books go through an editorial panel composed of Beacon Academy teachers before they are finally uploaded on this site. We hope that you find these little books useful. 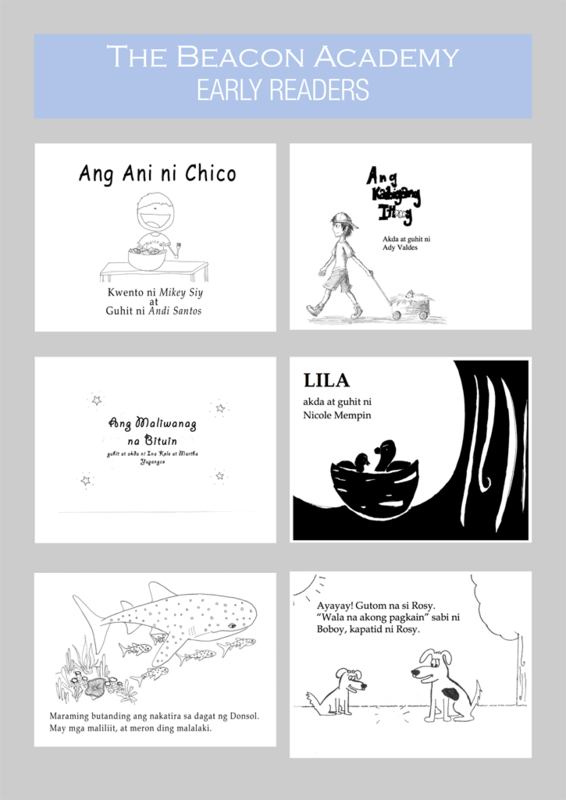 They are available in two formats: a PDF file for the original titles written in Filipino, and another file containing only the illustrations. The second file is provided for teachers and parents teaching children whose mother tongue is a different Filipino language. Simply print out the book and provide your own translations to the story. We do ask that you share your translations with us, so that we can upload the story in a different Filipino language. These little books are free for anyone to use. Please do not sell them. A note about printing: You will need Adobe Acrobat Reader to read and print these books. Download the program HERE.